The IRA is implicated in the world's biggest art theft mystery and a Brexiteer warns of getting stuck in a "circle of hell" in Monday's papers. The Belfast Telegraph reports murdered US gangster James 'Whitey' Bulger was suspected of giving stolen art worth $500,000 (£384,000) to the IRA. The 13 paintings were taken from a US museum in 1990 and were never found. An ex-Scotland Yard detective suspects Bulger was involved and that the loot is stashed in the Republic of Ireland. The paper says the heist is "regarded as the biggest unsolved art theft in world history" and Bulger, who was killed in prison last week, has now taken the secret to his grave. 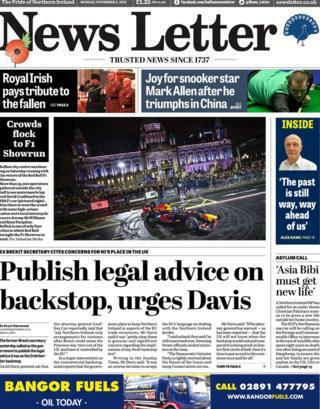 The News Letter leads with a call from former Brexit secretary David Davis for the government to publish its legal advice on the Irish border backstop. The backstop is a position of last resort to avoid a hard border when the UK leaves the EU, but Mr Davis claims Downing Street officials "misled ministers at the time" on its implications. Writing in the Sunday Times, Mr Davis said it was "an unwise decision to accept the EU's language on dealing with the Northern Ireland border". He claims that that legal advice from the UK's attorney-general compared a backstop without an end date as "being stuck in Dante's first circle of hell". The former leader of UKIP in Northern Ireland, David McNarry, writes to the News Letter to complain that staying in the EU Customs Union after Brexit is a "preposterous proposal". He claims that Prime Minister Theresa May has "remained a Remainer" and says both she and her Cabinet should be "booted out" if they agree to such a deal. Brexit also makes the front page of the Irish News, which leads with the headline: "Don't leave us behind Leo." It reports that 1,000 people have signed a letter to Taoiseach (Irish Prime Minister) Leo Varadkar, urging him to fight for the rights of Irish nationalists in Northern Ireland in the Brexit talks. The letter raises concerns about the future of cross-border health care and education and signatories include several high-profile figures that "represent a breadth of nationalist opinion". They include film director Jim Sheridan, actor Adrian Dunbar and footballer James McClean. Mr Varadkar warned at the weekend that Brexit was pulling "Britain and Ireland apart" and undermining the Good Friday Agreement and Anglo-Irish relationships. However, unionists have criticised the taoiseach's language, with the Ulster Unionist Party leader telling the News Letter it was "at worst a deliberate attempt to heighten tensions". DUP leader Arlene Foster has also called on politicians to stop using the history of the Troubles to advance their position in the Brexit talks, according to the Belfast Telegraph. "Those of us who lived on the border in those days have very little tolerance for such arguments," Mrs Foster says. "There was never any justification for violence." The Telegraph leads with a £30m "black hole" in the Police Service of Northern Ireland's budget after it lost a landmark pay dispute. It reports that the PSNI was judged to have made "unlawful deductions" from the holiday pay of 3,700 employees, which it must now pay back. The paper says those affected now stand to receive refunds of several thousand pounds each for unpaid overtime. The 20mph speed limit outside Belfast City Hall was put on hold at the weekend as Formula One sped into the city. Former F1 star David Coulthard thrilled fans by "reaching speeds of up to 125mph" as he zoomed past the building on Saturday night, according to the Irish News. The Red Bull Racing F1 Showrun exhibition also makes the front page of the News Letter. Never judge a book by its cover they say, and one charity shop has a novel idea on how to enforce that age-old proverb. The Quaker Charity Shop on Belfast's Lisburn Road has wrapped its second-hand books in plain paper, with just a small clue scrawled on the package to tease readers on which book might be inside. The "blind date with a book" promotion has been caught on camera by the Irish News.